photo-eye Gallery is pleased to announce our newest Gallery artist Steve Fitch! Steve Fitch is a photographer and educator who has been making photographs of the American West for more then four decades. As a boy, the scenes that he observed out of the window of his father's 1951 Buick fascinated him. In the introduction of Fitch's first book Diesels and Dinosaurs, he recounts memories of observing small towns, glowing neon signs and 18-wheeers roaming the highway. Fitch was also witness to the rise and fall of the drive-in theater. All were experiences that molded his interests as an adult, leading to his visual studies of the highway culture of the American West and man's encroachment upon the land. Fitch currently has five portfolios of work on the photo-eye website: Vernacular Assemblages, Llano Escandado, Gone, Diesels and Dinosaurs, and Western Landmarks. All of the portfolio's may be viewed by visiting www.photoeye.com/SteveFitch. If you are in the Northern New Mexico area, please stop by the gallery Saturday February 25th from 3-6pm for an artist reception and book signing with Steve Fitch. 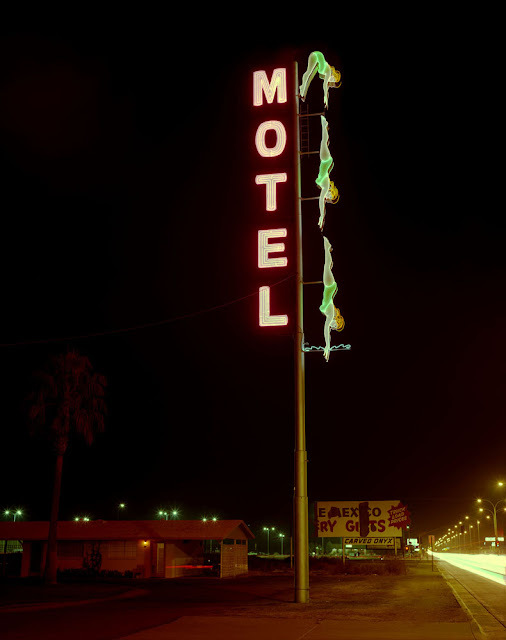 The photo-eye Gallery exhibition of Fitch's images, Highway Culture will run through April 14th, 2012. Signed copies of Fitch's books, including Diesels and Dinosaurs (1976), Gone (2003), Llano Estacado (2011) and Motel Signs (2011), are available at photo-eye Books. This past monday Steve Fitch was interviewed by Mary-Charlotte on the Santa Fe Radio Cafe. You can listen to the interview here. If you would like to reserve a signed copy of one of Fitch's books or have any questions regarding the exhibition, please contact Anne Kelly (anne@photoeye.com) or Cliff Shapiro (cliff@photoeye.com) or by call the gallery at (505) 988-5152 ex 202.